Oakland is known for its artsy neighborhoods that offer plenty of parking options, especially when compared to San Francisco. There are even certain cases when parking in Oakland is free. Some tips and tricks to determine that ‘free spot’ is really free. Type any address and use the time filters on the map below to find a free Oakland parking spot. The map is free, easy to use, and will save you a serious headache when you’re on the hunt for free parking. Overnight parking downtown: If you’re downtown overnight, you’re in luck. Downtown meters run from 8AM-6PM Monday thru Saturday, so parking overnight is free. Free parking downtown during the day: Parking near the outskirts of the downtown area is free and makes for a nice walk to your favorite shops. 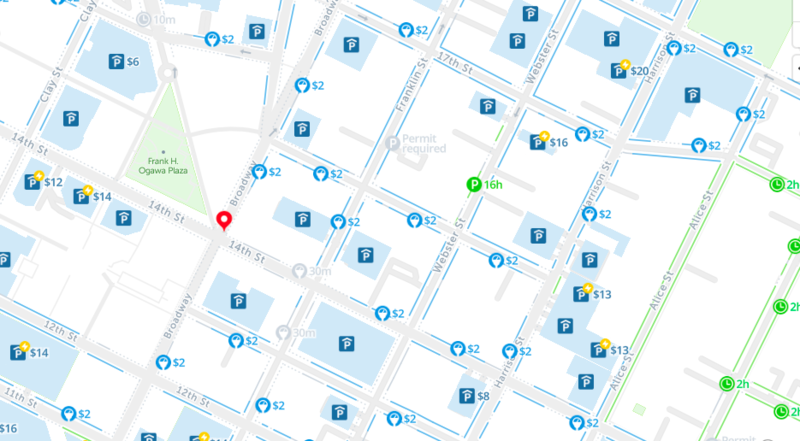 Check out the map to see which streets are free to park. Free parking on Sundays: Parking is always free in the city on Sundays. Free garage parking: If you’re here near the holidays, the City of Oakland often offers free parking in garages and parking lots throughout the city to encourage people to shop locally for gifts. Free parking on holidays: On city holidays, parking is free. Check out the schedule below.